ASPCA Reminder by We-Care.com by We-Care.com - Boost Your PC. What is ASPCA Reminder by We-Care.com? ASPCA Reminder by We-Care.com is a web browser toolbar designed for various charity organizations with the intention of providing a percentage of any purchases made by the user using the toolbar through a valid merchant back to the charity. The We-Care.com toolbar relies on the consumer becoming a member. If the consumer buys through this toolbar throgh a set of affiliate merchants they will donate a percentage of their purchase to a charity of their choice. Download Boost and enjoy your PC. Remove ASPCA Reminder by We-Care.com from your PC. Why should I uninstall ASPCA Reminder by We-Care.com? Removing unwanted toolbars is usually a good idea. The We-Care.com family of toolbars, like many browser plug-ins, has the potential to cause stability issues within the web browsers they load into, effecting overall PC performance. This We-Care.com toolbar is known to monitor your search queries and browsing habits in order to send you targeted ads and modify your search settings and results. “Use these Downloads to promote and raise money for your cause. The We-Care Reminder automatically makes your purchases count, even when you forget to click through the mall. You and your friends can fundraise as a team with the Shop & Give Gadget. And you can use our Web Badges to drive traffic from your website, blog, or social media profile to your cause's marketplace. When you download the We-Care Reminder, every time you shop at a participating merchant, a percentage of what you spend will be returned to your We-Care.com cause — at no cost to you! The We-Care Reminder is an affiliate and advertising platform with the intention to 'make it easy to support your favorite nonprofit every time you shop online'. By shopping online with the installed We-Care web browser extension installed, We-Care will collect affiliate dollars by injecting affiliate identifications into the shopping and purchasing experience. We-Care will then send a proceed of the affiliate collection to the branded charity of the web browser extension. We-Care has partnered with a number of very legitimate and well know charities including ASPCA and several Breast Cancer Awareness organizations. Merchants may vary their donation amounts based on the types of items purchased. To the right of the list item, click the Uninstall button and Boost will completely remove ASPCA Reminder by We-Care.com from your PC. 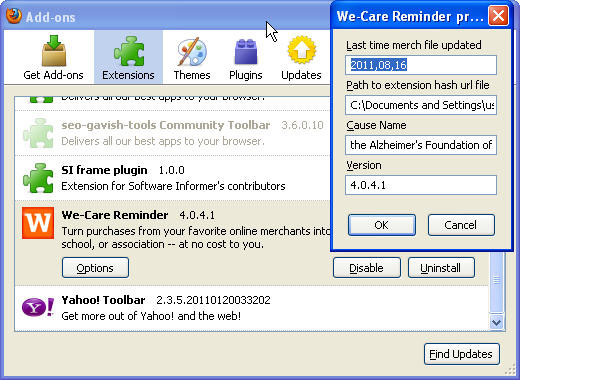 Use Add/Remove Programs control panel in Windows makes to uninstall ASPCA Reminder by We-Care.com. Follow the appropriate instructions below to use this control panel. Select ASPCA Reminder by We-Care.com from the list of programs, and click Uninstall. Alternatively, right-click the program and select Uninstall. Select ASPCA Reminder by We-Care.com from the program list, and click Uninstall. Alternatively, right-click the program and select Uninstall. Select ASPCA Reminder by We-Care.com from the list of programs and click Remove. Boost helps you remove ASPCA Reminder by We-Care.com and clean your PC.